One of my 2017 resolutions was of self-care - making an effort to unwind, destress, reflect and recharge. Spend more time reading, connecting with loved ones and finding those pockets of time to be quiet and thankful. It hasn't been easy and God knows I haven't been consistent but I've tried my best. One way the shopaholic in me has found to stay consistent is by buying/finding fun and enjoyable things to encourage consistency. So far, planning the books I want to read, decorating a lil corner in my home for quiet and my favourite right now, picking out relaxing scents and oils. 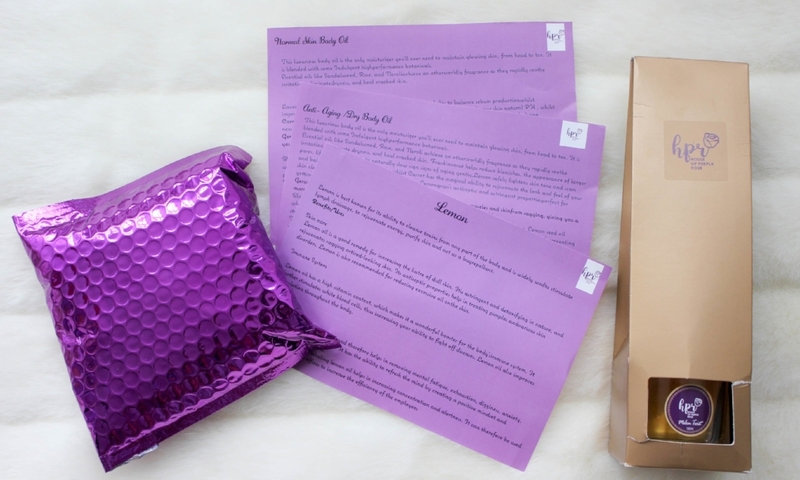 Both skincare and home fragrance products arrived in really nice packaging as you can see below. They also came with a sweet 'thank you' card listing exactly what the products are with the owner, Anne's contact information. They also came with 3 additional cards sheets with lots of interesting information on the oils - who knew lemon oil's a good remedy for dull skin! Now onto the good stuff. I was sent 3 oils, 4 perfume oils (1 large and 3 tiny ones) and a few reed diffusers. This consisted of luxurious body oils - dry/anti-aging 'Replenish & Revitalise' body oil, Sensidisiac massage oil and the lemon pure essential oil. All 3 smelt great and applied really well (yah! to massage oils). My favourite was the lemon pure essential oil, which can be used in a diffuser or humidifier or diluted with a carrier oil for a massage or a bath. As a citrus lover, the lovely lemony scent made using it even heavenly. This consisted of one large perfume oil and 3 tiny ones - bloom, flower whispers, sweet dessert. I love love gorgeous scents, so I cooed with happiness when I opened the package and saw these scents. The large one has had pride of place in my living room for weeks now. 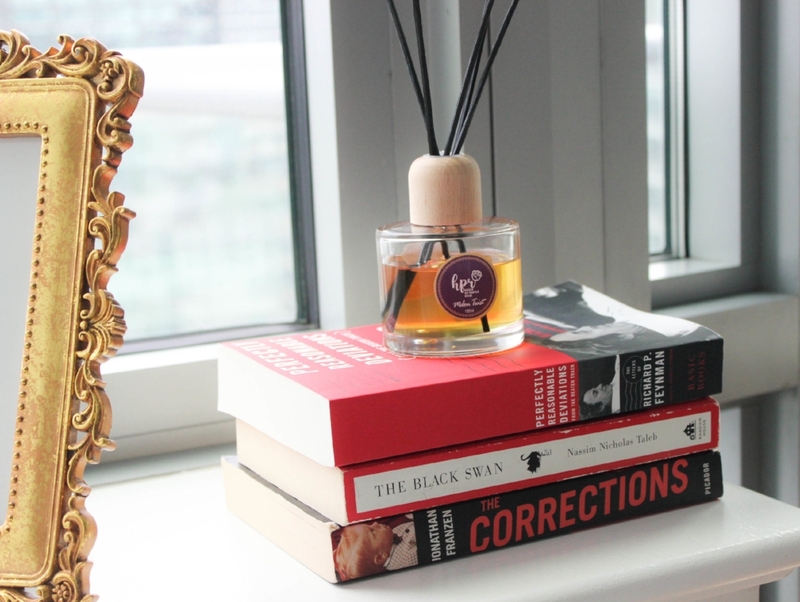 Every other day, I've turned over the reed diffusers and basked in its lovely perfumy scents. I haven't got a chance to try out the little scents yet but I'm looking forward to it! I've enjoyed using these lovely oils and scents these past few days. I have terribly dry skin so I'm not usually keen on trying anything with 'oil' next to it! I was pleasantly surprised how to nice these products were. Functional, pretty and educational! House of Purple Rose is owned by lovely Anne who lives in the UK. From the kind handwritten note to the detailed sheets of information, you can tell she puts a lot of love and care into these products. If you're looking for your next body oil or lovely scented oils or just natural handcrafted home and skincare products, please get in touch with Anne by emailing info@houseofpurplerose.com. You'll be in wonderful hands and supporting an up and coming brand.